It may seem that you’ve only just packed the kids off back to school after half term, but now is the time to sort out your child arrangements for the Christmas holidays. As any separated or divorced parent knows, sorting out who looks after the children over any holiday period takes careful planning and a fair degree of cooperation. The Christmas holidays come with an extra layer of emotional pressure, from who has to the children on Christmas Day itself, to issues over shared costs. Due to the way the dates fall, there is a clear two-week Christmas holiday period that many businesses might take advantage of. We expect many to close on Friday 21st December and take two weeks out until Monday 7th January. However, not every working parent will be able to take all this time off. Private schools tend to take a further week, either before or after Christmas. The differences are another reason to plan early, especially if you live in a different school district to your children. A child arrangement letter and agreement can often be the most effective way to organise your children, your ex and yourself over the holidays. Making child arrangements yourself can involve endless phone calls and diary negotiations which can be awkward, emotional and lead to potential misunderstanding. Instead, a professional, impartial letter from us can help set out exactly what you have agreed - or want to agree. It is set out in clear terms that both parties can understand and (more often that not) agree to after just one letter. 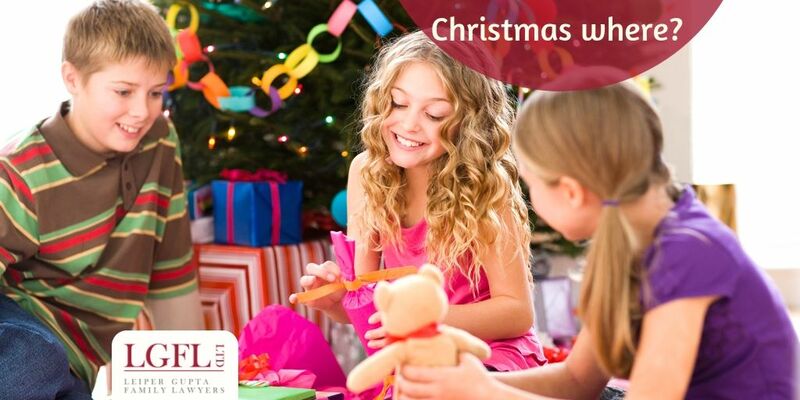 A Christmas child arrangements saves you time, stress and worry, leaving you both more time to enjoy the season with your kids. Whether you’re the resident parent or not, Christmas is a time when you may feel the emotional pressure of being a separated parent the most. Here’s our list of main issues past clients have experienced, and some suggestions of how to overcome these. This is probably the top issue - which parent gets the children on Christmas Day itself. The conflict is often between the parent with custody stating that the children want to be ‘at home’, and the absent parent wanting to share the special day with their children at their home. The fairest answer is, of course, that the children stay with one parent in the morning and one in the afternoon, so both see them on the day itself. However, this isn’t always practical in terms of geography, or compatible with celebrations involving extended family, including grandparents. Some parents resolve the issue by alternating year to year, or holding a second Christmas Day for the children, complete with extended family. It’s a case of planning out what works for you and your family, and preferably agreeing it in writing before the start of December. Again, this is such an emotive issue. Do children get all their presents on the day, or can the pleasure of receiving gifts be split between two days? If the joy of presents is as much in the giving as in the receiving, then having gifts presented by the absent parent in person, for example, is probably as important as the gift itself. This can cause all sorts of stress and upset, and not just at Christmas. The pressure felt by the lower-earning parent can be reflected in them trying to ‘keep up’. The costs of presents, food, outings and other expenses can involve them taking on more financial burden/debt than they can afford. Furthermore, many parents raise the issue of using gifts as an incitement or to influence a child. Here too, a level of cooperation can keep that to a minimum. A child arrangement letter can include as many details as you wish, such as a suggested spend limit on presents that both parents can afford. Even better is that the parties equally contribute if they can to the major present, to demonstrate positive co-parenting and avoid upstaging on Christmas Day. Christmas is a time when extended family members will often take the extra effort to come together and celebrate. Research has proved the importance of children knowing and being involved with extended family for their social and mental wellbeing and their sense of identity. Planning such events in advance, and scheduling child arrangements around them will ensure that children won’t miss out on these important family gatherings. This is where it’s important that parents set aside their own personal feelings about ex in-laws and focus on the needs of the child. If you are divorced or separated, planning a family foreign holiday at Christmas does involve a crucial item of paperwork. If you intend to go abroad with your children at any time of year, you must get permission from your ex. If you take children abroad without the permission of anyone else with parental responsibility, this is classed as child abduction and is a criminal offence. You should always get a permission letter from the person with parental responsibility and carry with you through all border controls ideally, or at least have an email trail. A child arrangement letter or agreement can help define exactly the arrangements for when children are away. As the world becomes more global, many parents are based abroad for work purposes. A common issue now emerging is whether a child should be allowed to travel as an Unaccompanied Minor with airlines. As with all arrangements, a child-centred approach needs to be adopted at all times. Similarly sometimes a parent needs to accept that for some parents this is simply too much of a worry. In this case, perhaps a compromise is necessary such as sharing the travel arrangements or the costs of airfare tickets. Need help with Christmas child arrangements? Call us to discuss our Christmas child arrangement letters or agreement, a way to a more stress-free holiday and a happier New Year!